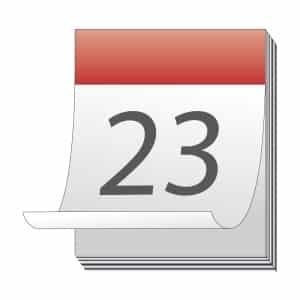 Home > French Blog > French Vocabulary > How to Say the Date in French – Le or no Le ? Le or no le ? That is the question… Students don’t seem to get it right, so I simplified things for you. I am not saying these are the only possibilities, but if you follow these guidelines, you won’t make mistakes when saying the date in French. Before I start my grammatical explanation on how to say the date in French, if what you were interested was “datING in French”, go to the end of this article! Aujourd’hui, nous sommes lundi. Today is Monday. Quel jour sommes-nous ? What day is today ? Quel jour est le concert ? What day is the concert ? Le concert est mardi. The concert is on Tuesday. Noël tombe quel jour cette année ? Christmas is going to be on what day this year? Ton anniversaire est le combien ? What is the date of your birthday ? C’est le 16. It’s the 16th. Please also note that Days of the weeks and months are not uppercase in French. 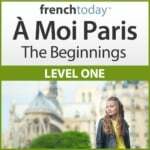 To learn the basic French expressions used for dates such as the days of the weeks, the months, and their correct modern French pronunciation, I invite you to check out my downloadable audio method for beginners: À Moi Paris 1. Let me insist, since I hear many mistakes with that part. Don’t say: sur le samedi, en samedi, le samedi, sur samedi, au samedi… j’ai dîné avec Henri. Do say: samedi, j’ai dîné avec Henri. If you use the construction LE + DAY it means something that you do every week on that day. Le lundi, je dîne toujours au restaurant. (every Monday). J’ai une classe de français le vendredi. (on Fridays). Full disclosure… Yes, saying “le mardi 3 octobre” is absolutely possible in French. But so is saying “mardi 3 octobre”… So I offer a shortcut. A way to avoid making a mistake. When you use the day of the week, don’t use “le”, unless you want to say you do it every week on that day. Just remember: day of the week, no le, and you’ll avoid a common mistake! J’ai un rendez-vous chez le dentiste le 3 octobre. Le 6, je dîne avec Henri. Aujourd’hui, nous sommes le 15 mai 2016. Mon anniversaire est le 16. When you don’t have the day of the week, then you need to introduce the date (the number) with le. J’ai un rendez-vous chez le dentiste en octobre. Nous sommes en mai 2016. En 2011, je vais aller à Paris. There are two words to say “year” in French. “An” is usually used with a number, when saying your age or counting years. J’ai 44 ans. I’m 44. Je suis allée en France il y a deux ans. I went to France 2 years ago. “Année” is used to describe the whole year span: it is mostly used in expressions such as “l’année dernière / prochaine”, “toute l’année” (all year long). Je vais en France tous les ans – I’m going to France every year. J’ai étudié le passé-composé toute l’année – I spent the whole year studying passé-composé. So, for the expressions using an / année, it’s mostly a question of memorizing them. You may also be interested in my articles about New Year’s Eve in France and Making New Year’s Resolutions in French. 6 – What About Dating in French? Since we are on the subject of dates, let’s not disappoint people who searched for “Date French” looking for advise on “how to date in French” and found this grammar article! 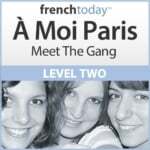 I wrote two articles about dating in French, since the way French people date is quite different from the American way. How to Ask Someone Out on a Date in French? Why French Women Don’t Date – the French Dating System Explained.